particular flower types will be available, but we'll do our best to create the look you're going for. the crib in the nursery, or as the couple's initials at a wedding--so many uses ! PLS NOTE: Due to the handmade nature of this item and flower availability, it may not look identical to the photo. We will try our best to use the exact colors and flowers, when possible, to re-create a specific look though. DaRongFeng: We provide whole-hearted services. Any questions will be answered within 24 hours. We will try our best to solve your problems. If you like our products, please share your experience! We will appreciate your feedback! Each silk flower was selected personally by our designer to fit the theme. Made with environmentally friendly wood,satin,and artificial floral. 100% handmade by professional craftsmen to ensure the quality. 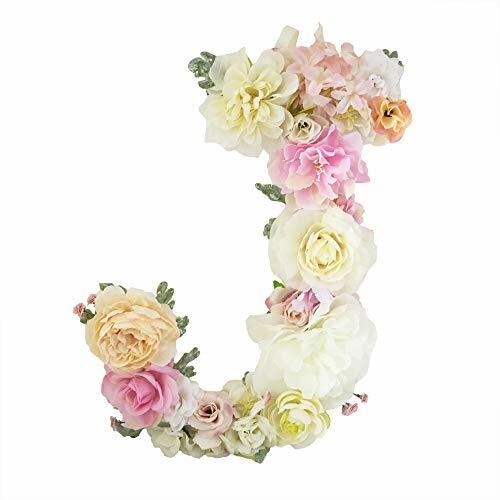 Perfect decor for party, wedding, baby shower,nursery,children room ect. Great gift idea for your friends, family on the brithday, Valentine's Day, Mother's Day,wedding anniversary,and more. If you have any questions about this product by DARONGFENG, contact us by completing and submitting the form below. If you are looking for a specif part number, please include it with your message.